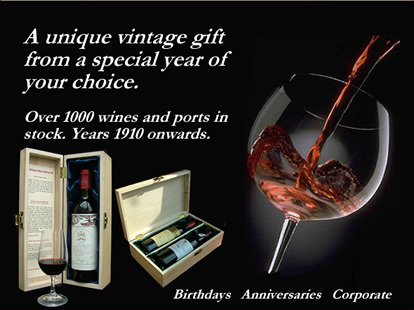 Port wines from 1965 make a great 54 year old wine gift, whether for a 54th birthday or anniversary. Ports of this year were shaped by a hot dry summer, with a little welcome sporadic rain. In general they are rich and powerful port wines with burnt coffee bean tawny characteristics typical of a hot vintage. The vintage was not declared by the major port houses who were looking ahead to the glorious 66 vintage, and there are very few single quintas port around, however there are some outstanding colheita ports available such as the highly recommended 1965 Taylor's Single Harvest . Whilst Bordeaux suffered from poor weather, Piedmont and Tuscany produced an abundant crop of long-lived wines that still make good drinking today. 1965 Bordeaux Wines are generally considered to have produced a poor vintage due to wet weather. It is unlikely that anything other than the first growths will have stood the test of time. Bordeaux, in the south-west of France, needs little introduction to anyone with an interest in wine. One of the world's most prolific wine regions, it also manages to rank among the most famous and prestigious. Chateau Latour and has been for many the most consistent performer amongst the First Growth Wines over the past century, acquiring an enviable reputation for producing very good wine in the more challenging vintages. A good wine. On the nose, bthere is some orange marmalade, honey and spice character in this wine. Turns quite woody, with lots of caramel. YQUEM NOTES: It was very cold from April to September which dashed hopes for good ripeness.